Longtime readers know that I feel resonance is an important part of game design. For example, "Resonance is important" was one of my 20 lessons from my 2016 Game Developers Conference talk (here's the speech in article form—Part 1, Part 2, and Part 3—and video form), but I realized the other day that I'd never written an article specifically about resonance, so I decided I'd fix that today. Before I'm done, I'll walk you through why I feel resonance is so important and talk about numerous ways we use resonance in making Magic. Let's begin by defining what exactly I mean by "resonance." Resonance is when you build a game component on top of information the audience is already familiar with. For example, when Richard Garfield first made Magic, he needed an evasion mechanic that would help break up stalemates. He turned to the real world and asked, "How might one creature get past another?" Perhaps it could fly over the other creature. Richard then took the concept of flying and crafted a mechanic around it. Doing this had several benefits inherent in using resonance. Everyone understands what flying is because we've all seen birds and airplanes. The idea of moving through the air is something we're familiar with. This creates a sense of comfort because the game is using an idea we already know. (Check out my article on communication theory for more on why humans crave comfort.) If Richard had done the exact same mechanic except using a made-up word, the players' first response would have been "What is that?" instead of "I know that." It would create a sense of concern as they had to figure out what it was, rather than a sense of comfort as it already fit into the world they knew. A game has a lot of new things it must teach you. Every time you can lean on something the audience already knows, the more accessible you make your game. 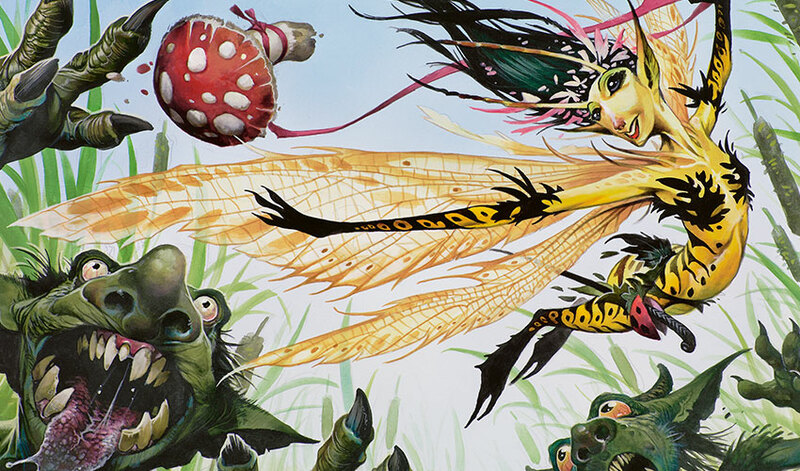 Magic has a lot of creatures. We want them to feel different from each other. One of the ways to do this is by creating subcategories. A flying creature means something to people. It allows them to think of it in a way that separates it from other creatures. And because this is building on knowledge we already have, it allows us to link the creature to a database in our mind. For example, if I tell you a set has a 1/1 black flying creature, you can start coming up with possibilities for what it is before you even see the name or the art. It's just one word, but that word carries a lot of connotations because it's building off information you came into the game with. Learning is hard. Whenever we as game designers can help the players learn something faster, we're making our game easier to connect with. Flying is tapping into preexisting knowledge. That means that players can guess how it works by using what they know about the concept of flight. I have a flying creature, and you have a non-flying creature. I attack. What happens? The non-flying creature can't block the flying creature because it flies overhead. What if the non-flying creature attacks, can the flying creature block it? Yes, because it can fly down to block. Whenever I teach someone to play Magic, this is how I teach them about flying. I ask them what they think will happen and almost always their intuition is correct. That means the concept of flying is doing a lot of work helping players understand how the mechanic functions. The learning of any game is a challenge of acceptance. A player who knows nothing about your game (or at least very little) makes the choice to experience it. There are two likely outcomes: One, the experience is positive and they are interested in playing it again, or two, the experience is negative and they have no interest in playing again. Most of the time, the latter means they will never play your game again. As a game designer, what can you do to increase the chances of the first scenario? If they enjoy how the game makes them feel when they play, they'll most likely want to play again. How do we do that? It starts with them feeling comfortable, because that allows them to willingly open up to the new experience of your game. As I wrote about in my communication theory article, humans need to first feel comfort before they can enjoy surprise. What's the best way to make them feel comfortable? By providing familiarity. Another way you can capture a new player is by making them fall in love with your world. If the creative elements really speak to them, it can pull them in. What's the key to making that happen? The answer is connectivity. People bond with things because it reminds them of something they love in the real world. That thing doesn't have to be the real-world thing verbatim, but it must be evocative of it. This, for example, is one of the reasons we've made such a push for diversity in Magic because when players see people like themselves in the game, it increases their ability to connect and bond. All of this comes down to flavor, to using elements that directly or indirectly tap into what the player already enjoys. The third way you can draw players in is by getting them to enjoy the game's functionality itself. They like how it works and what it asks them to do. The act of playing it is fun. For this to be possible, though, the players must understand the mechanics. If they're struggling to understand or miss fun elements because they are unaware of them, this impedes their ability to enjoy the game. This means functionality is crucial. You need to use every tool available to maximize their ability to learn. What this all means is that resonance is an invaluable tool for a game designer. It helps the player connect emotionally, it increases the player's enjoyment of the creative, and it enables them to learn and enjoy the game's mechanics. Now that I've explained why resonance is so important, it's time to talk about how we weave resonance into Magic design. For this section, I'm going to start very broad and then work my way to the more specific. The very first thing we do when making a set is figuring out what it's about. A big part of doing that is figuring out what world it takes place on. For ease of simplicity, I'm going to divide this into two parts—top-down (where we start with a creative idea) and bottom-up (where we start with a mechanical idea). I do want to note that in modern design, we go back and forth between creative and mechanics very early, so while we start with one or the other, most designs have a lot of give and take between the two sides which results in sets where it's hard to tell whether we started one way or the other. Also, we often return to worlds. In those cases, a lot of what I'm going to talk about happened when we designed it initially. Sometimes we start by coming up with a world influenced by some real-world component. It could be a genre of pop culture (such as Innistrad's Gothic horror theme), it could be an existing mythology (such as Theros's Greek mythology theme), it could be culturally based (such as Khans of Tarkir's various influences for the clans—and yes, Khans of Tarkir technically started bottom-up, but it could have started with the clans). In each of these cases, we're trying to build a world based upon elements known to our audience. The resonance is baked into the world. The expectation with a top-down world is that they will have a big draw because the players will want to see how we approached the resonant source. "A Gothic horror world sounds fun. I'm curious to see how they bring it to life." Thus, the trick to designing a top-down world is using the expectations of the resonance as a guide post for the mechanical design. For instance, Innistrad ended up with double-faced cards because we were trying to bring Werewolves to life. We knew that what made Werewolves cool was the fact that they existed some of the time as Humans and some of the time as Werewolves, with the Werewolf side being far scarier. In this case, the resonance is the structure you build the set upon. Other times, we start by coming up with a mechanical hook. 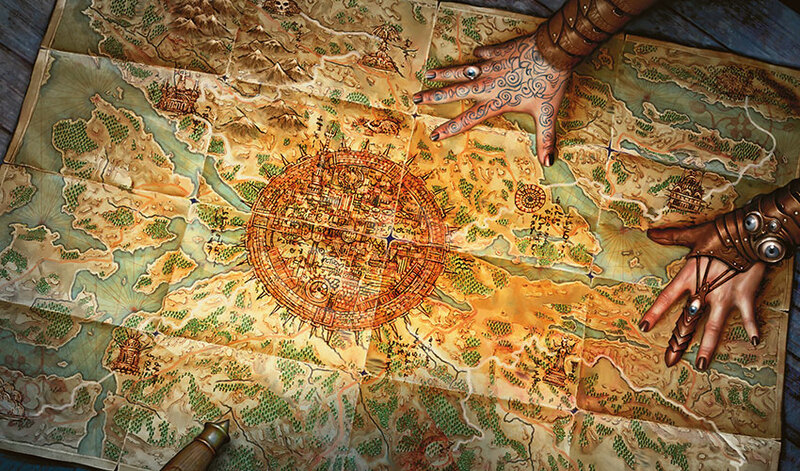 The set is based on a game component (such as Zendikar's focus on land mechanics), or a theme (such as Time Spiral's focus on time and nostalgia), or a structure (such as Ravnica's ten-faction framework). In each of these cases, we have to find a resonant world concept that brings the mechanical world to life. Usually this is accomplished by figuring out the creative constraints of the mechanical execution. For example, Zendikar was playing around with land mechanics, which meant we'd have to have a lot of cards with pictures of the landscape on them. Also, the themes of the set led us to want a conflict of the people versus the land as the basis of the story structure. Those two elements coming together pushed toward the idea of exploring an adventure world trope, a lush but hostile world filled with treasure. Bottom-up worlds differ from top-down worlds in that the structure is not set by the resonance. This means that the resonance on these worlds is more of a dressing to make the mechanics pop in focus. This requires more work spent making sure the mechanics themselves feel resonant. I'll use Zendikar again as an example: We liked landfall as a mechanic and enjoyed how it played, but we knew it was devoid of a strong resonant connection. That meant that we needed to surround it with mechanics and themes that had a stronger resonance. Quests, Traps, and Allies were all designed as super-flavorful components that would help sell the sets overall resonant themes. A good way to think about the contrast between top-down and bottom-up is that top-down sets tend to have stronger card-by-card resonance (individual cards which capture known resonant archetypes or tropes) while mechanical sets tend to have a stronger mechanical resonance (mechanics that sell the themes of the world). The importance here is that either way we get to the world, it ends up with strong resonant themes that can draw the players into the set. Much like worlds, mechanics also tend to have a top-down or bottom-up origin. Let's walk through each. A top-down mechanic is one where the idea starts by capturing a concept. For instance, ninjutsu was capturing the sneakiness of Ninjas. Embalm was capturing a cultural aspect of ancient Egypt. Sagas was capturing the idea of a story. Each of these mechanics started not as a mechanical execution but as a theme the design wanted to hit. We then spent time trying to figure out how best to execute that theme. Like top-down worlds, top-down mechanics have the resonance baked into them. A bottom-up mechanic starts as a something that plays well. Its impetus isn't capturing an idea but rather digging into interesting mechanical space. With bottom-up mechanics, we have to spend time giving them a flavor that reinforces their function. It wants to be as flavorful as possible, but more importantly, we need it to help sell the mechanic as a concept. I'll use energy as a good example. The mechanic was designed in original Mirrodin as a means to give more diversity to artifact activations. Instead of having artifact A have three activations and artifact B have three activations, they now had a combined six activations. The mechanic got kicked out of Mirrodin for space reasons and was sitting around as a neat mechanic without any particular flavor looking for a home. When we got to Kaladesh, we dug it out of the moth balls because it felt like it might feel at home in a set about technology. The creative team then spent a lot of time building a cosmology into the world that reinforced the flavor of it being the energy source of the world. Once this was established, we then started designing cards that played into the resonant theme. Interestingly, mechanics work a little backward from worlds. With top-down mechanics, we tend to focus the resonance on a wide level, insuring that all the cards with the mechanic play into its flavor. With bottom-up mechanics, we're more likely to try and design individual cards that sell tropes of the flavor. In other words, embalm gets sold on the fact that every embalm card had a similar flavor hook (all the cards had a token that showed its creature being mummified) while energy got sold more on individual cards that hammer home different tropes about energy. Every Magic card needs a piece of art. That means that we have to understand flavorfully how the card's mechanic is being filtered through the creative lens. Essentially, what does this card represent in tangible form? What is it or what is it doing? This requires a member of the creative team to sit down and decide what each card represents. This is then turned into the art description sent to the artist. The card concept is important because this is often where the resonance gets added if it isn't already baked into the card. For example, let's say we have a card that deals direct damage to a creature. That card comes with a little bit of resonance baked in, as damage is a thing in the real world, but there are a lot of different types of damage. The card concept has to define what exactly this damage is. This can be figured out in a few ways. Perhaps the card has extra mechanical elements that can be used to help fine-tune its flavor. Let's say that it has "If the creature is put into the graveyard, instead exile it" text. That implies that the direct-damage spell is going to leave no trace of the body of the creature. That will push the concept in a certain direction. Another way it can be approached is by looking at a way to reinforce the world. 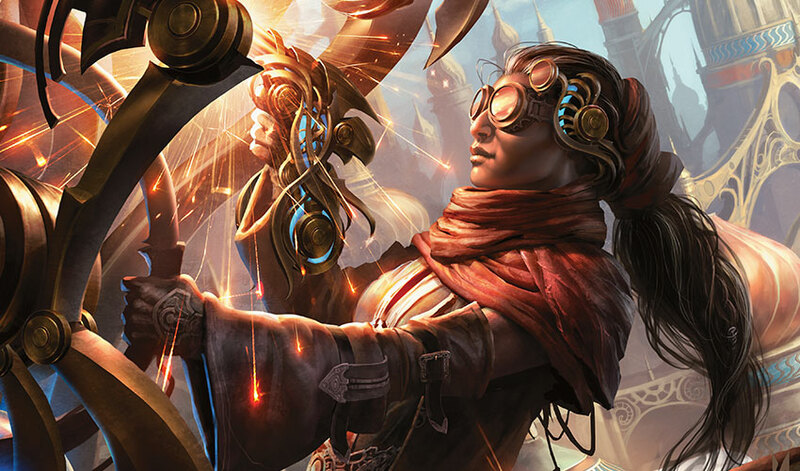 For example, on Kaladesh, the magical spells were flavored as being based in technology. A direct-damage spell there is more likely to come from a device than a Wizard's fingertips. Those two elements combined push the card concept in a certain direction. No matter what direction guides the card concept, the one constant is the desire for resonance. The more the spell justifies and explains what's going on, the better it will be received and the more it will help players play it correctly. For example, the Creative team works very hard to ensure that every flying creature looks as if it can fly and every non-flier looks as if it can't. Names are very interlinked with the card concept. Usually, the card concept comes first, but sometimes cards are designed top-down from their name (Innistrad block did this a lot, for instance). The names often become important for resonance when the art doesn't completely sell the overall concept. (The biggest reason for this is that cards can mechanically change after being assigned to an artist.) If the art is doing a good job selling the resonance, the name can be a bit more flavorful and evocative, but if the card needs the help, the name can be repurposed to be more blunt in its communication of what the card represents. Flavor text is the last bastion of communicating resonance. If the mechanics, art, and name aren't quite doing it (and the card has flavor text), we can often use the flavor text to help communicate what's going on with the card. As with the name, if the rest of the card is doing its job well, there's freedom to lean toward being more entertaining than explanative. And that is why resonance is important and how we weave it into every set. I hope you enjoyed today's column, and I look forward to seeing any thoughts you have on it via email or on any of my social media accounts (Twitter, Tumblr, Google+, and Instagram). Join me next week for another Storm Scale article. Until then, may you bond with the game in ways that bring you joy.